Today, I will show you how to find H.C.F (Highest Common Factor) of two or more numbers the quickest way. You won’t find this trick anywhere, this is exclusively available here on Aeiro.Com. HCF or Highest Common Factor is the biggest number that can divide each of the numbers in question. You can find HCF of two or more numbers. Now let’s first see how we usually find HCF of numbers say 25 and 35. To do this divide the bigger number 35 by the smaller number 25. 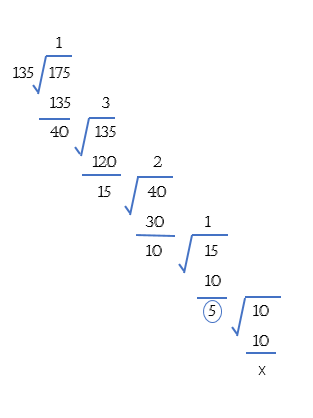 By doing this we will get a remainder of 10, then we divide the previous divisor by the remainder i.e.,10. Again, we will get a remainder of 5. 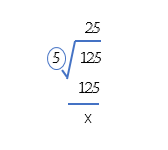 At this step, you will find that the new remainder i.e., 5 will exactly divide the previous divisor i.e., 10. Hence, our HCF is 5. Look at the calculations below. Since, HCF of these two numbers is again 5, therefore, HCF(125,135,175) = 5. Now, check whether “10” divided all the three numbers 125,135 and 175? No, it clearly does not. Divide 10 by 2 = 5 and check whether it can divide all the three numbers? Oh yeah! it does. Trick Alert: Fastest way to find the square of any two digit number in mind. A quick trick to help you square any two digit number in mind. This will change your perception entirely about how you square.